HBO viewers will be saying goodbye to yet another series very soon. After five seasons, The Wire has wrapped its final episode. The Wire debuted on June 2, 2002 on HBO. The gritty inner-city drama was created by writer/producer and former Baltimore Sun police reporter David Simon. Years earlier, Simon had created NBC’s Homicide: Life on the Street, a series based on his own non-fiction book. 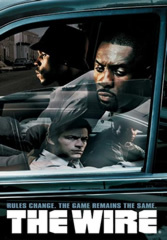 The Wire initially focused on the war between the Baltimore police and a drug cartel but later expanded to focus on the impact of drugs on different parts of the community. Though the series generally receives critical acclaim, its ratings have never been stellar. Last season, each episode averaged only 1.6 million viewers. Simon has attributed this to the show’s heavy use of slang, the timeslot, the setting, and the cast being predominantly African-American. Others have also pointed to the fact that another gritty drama, The Shield, debuted on FX around the same time. Simon has been planning the end of the series for quite some time. He’s always seen The Wire as a visual novel and reportedly wanted each season/chapter to focus on a different aspects of inner-city life — drug trade, politics, reform, schools, etc. The final 10 episode season will focus on the media and follow a morally-challenged reporter played by Tom McCarthy. Production on season five began on April 30th and the final bit of shooting took place Friday night and very early on Saturday morning. The episode was fittingly directed by Clark Johnson who also directed the pilot. Johnson was a regular on Homicide (Detective Meldrick Lewis) and plays a newspaper editor in season five of The Wire. The fifth and finale season of The Wire is set to debut on January 6, 2008. Stay tuned!